Canes are among the most common mobility aids on the market. They are readily available and relatively cheap, making them the first solution many people turn to for their mobility issues. Unfortunately, that $20 round-handled cane from the local drugstore may cause you more problems than it solves. The wrong cane handle can put stress on your wrist, and if your cane is too short or too tall, it will only make things worse. When choosing a cane, you will want to consider several factors to help you find the walking aid that is right for you. As your main point of contact with your cane, the comfort of the grip is of singular importance. You’ll want to consider material, shape, and design. Standard round canes can provide a smooth and classic look, but can be difficult to hold. Contoured grips provide a solution, and can be made from a wide range of materials. Try a long-wearing foam grip or an ergonomic gel grip to get the best possible fit for your needs. The shape of the handle can mean the difference between the cane you carry with you at all times and the one you leave in the umbrella stand. If you have trouble holding a standard hook-shaped tourist cane, try a Derby or Fritz handle instead, which have been designed to accommodate users with dexterity issues. If you need more stability, try an offset handle meant to distribute your weight along the cane. Cane tips receive a lot of wear and tear over the course of the day. Some canes do not have any reinforcement on the tips at all, which may be fine for light use. Others come with a reinforced rubber or plastic grip for added stability. 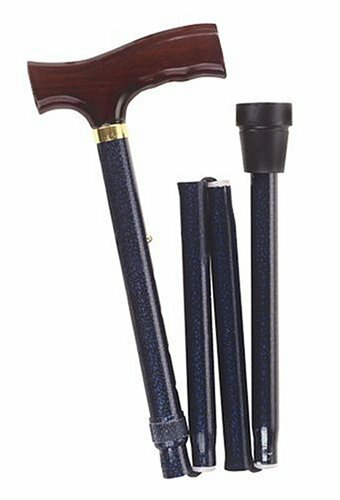 If balance and stability is a concern for you, definitely look for these high density rubber-tipped canes or consider upgrading to a quad cane tip. The best way to determine what size of cane you need is to have a friend or family member measure you. Wearing your normal walking shoes, stand as straight as possible with your arms falling naturally at your sides. The proper height of a cane should be the same as the distance from your wrist to the ground. Adjustable canes allow for the best possible match with a user’s height. One of the first things to consider when choosing a cane is just what type of cane you would like to use. Standard canes, or single-tip canes, are those with only one cane tip that touches the ground. Quad canes, also called quad-point canes, broad based canes, or four legged canes, are built to be sturdier and feature four cane tips. Think about why you need a cane, and what will best assist you in your daily activities. 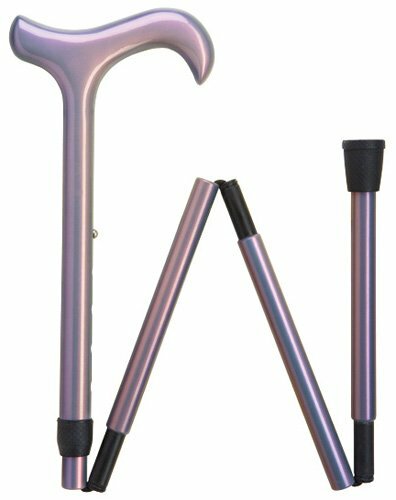 If you are recovering from an injury to your leg, ankle, or foot, you are looking for a cane to give you added stability on your course to recovery. The most stable cane available is the quad cane, which can have a large base or a small base. The large base quad cane is the most sturdy, stable cane available, while the small base quad cane is smaller and more mobile. Quad canes are the most stable, but they are inevitably heavier than standard canes. For those with limited upper body strength or weak wrists, this can be a big problem. 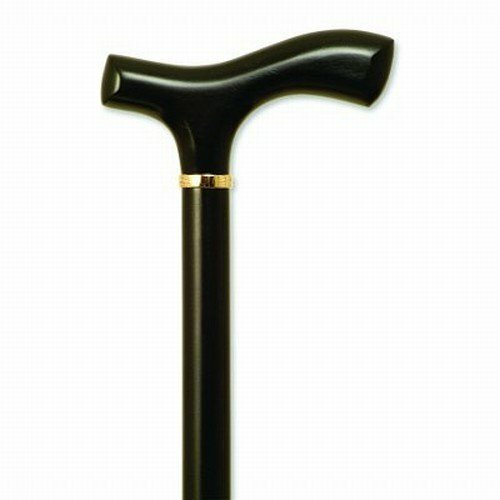 If the weight of the cane is a consideration, you will want to consider a standard cane as your mobility aid, or upgrading to the ultra-light 8.5 oz. 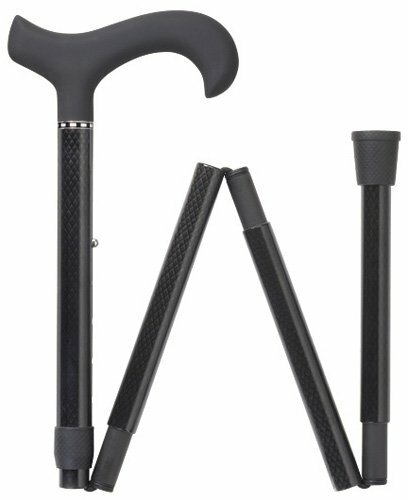 Carbon Fiber Quad Cane. In some cases a large base quad cane is simply not viable. Staircases may not have enough space to support all four cane tips, making it dangerous to use. Narrow hallways may not allow for the maneuverability a large base quad cane requires. If these are considerations for you, a small base quad cane or standard single-tip cane may be your best choice. Also consider that many single base canes can fold down to a much smaller size, making them convenient to carry with you when not immediately needed. Canes are among the cheapest mobility aids available! 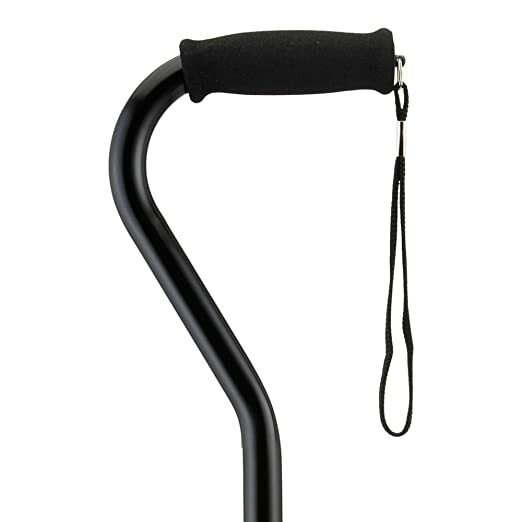 Even the most advanced canes are less than half the price of any rollator walker. However, quad canes do tend to run a little more expensive than standard canes. For those on a tight budget, a small base quad cane may be the ideal balance of safety and economy. Folding Seat Canes are becoming wildly popular and for good reason – they are one of the most practical mobility devices you can get. What is a seat cane you may ask? Well, it is just what it sounds like – a cane that can be transformed into a seat! Great for ball games and long lines, you never have to worry about standing for long periods of time. Folding Seat canes come in two main styles – tripod seats and sling seats. 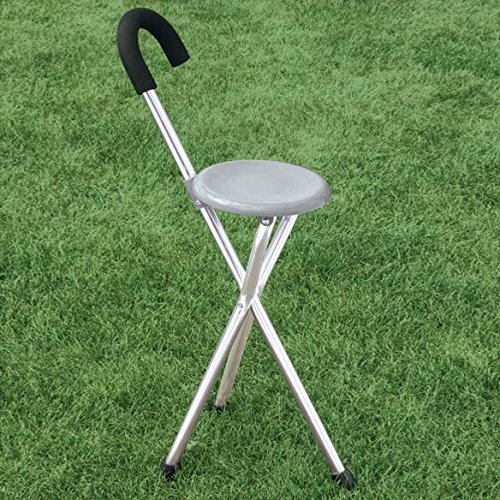 For a tripod seat cane, a handle allows two additional legs to unfold and support a sitting platform. The user sits with the cane handle between their legs. Be careful not to sit backwards, or the seat may tip over! For a more ladylike solution, there are sling seat canes. This type of seat cane allows you to walk with a two pronged base. When ready, you release the two folded legs and plant all four on the ground. A fabric sling is then strung between the two sides to create a comfortable seat. Are you using it primarily as a seat? If so, you want a comfortable seat such as a sling seat cane. Does the overall weight matter? Tripod seat canes weigh less than sling seat canes. Do you like to cross your legs? With tripod canes, the handle goes between your legs. Style, design, and color are as important in a cane as they are in any accessory. There’s no need to carry a plain grey cane when there is a vast array of designs and materials out there for you to choose from! Find one that fits your style, and the cane becomes a fun accessory rather than a necessary burden. Canes are meant to take the weight off of one leg and provide relief to the muscles, so using your cane the proper way is vital. Place the cane on the correct side. If you are using a cane to take the weight off an injured leg or foot, make sure to hold it in the hand opposite the injury. If your right leg can’t hold weight, the cane goes in your left hand. If your left leg needs the support, hold the cane in your right hand. If you are simply using the cane for added stability, then hold it in whichever hand is most preferable. Step forward with the cane and the injured leg. Grasp the handle firmly. Placing all your weight on the stronger leg, move your injured leg and your cane one step forward, keeping them even. Place them down together. Step forward with your strong leg. Let the cane handle take most of your weight as you lift your strong leg, move it forward one step, and place it on the ground. Shift your weight to your strong leg. With a little practice, using your cane will become second nature to you. You will develop a quick gait which allows you to move easily without straining a weak or injured leg. Place the cane on the correct side. If you are using a cane to take the weight off an injured leg or foot, make sure to hold it in the hand opposite the injury. If your right leg can’t hold weight, the cane goes in your left hand. If your left leg needs the support, hold the cane in your right hand. If you are simply using the cane for added stability, then hold it in whichever hand is most preferable. Hold the railing or banister. 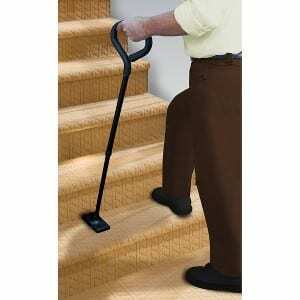 Whenever possible, hold onto a fixed support with your free hand when going up or down steps. This will stabilize you and take some of the weight off your injured leg. Going up steps, lead with your strong leg. Lift and place your strong leg on the first step. Transfer your weight to it, hold the banister, and only then lift your weak foot. Move the cane evenly with your weak leg, placing them down together on the same step. Support yourself with the banister and cane as much as possible. Going down steps, lead with your weak leg. Place the cane tip and your weak leg on the first step and bend the knee of your strong leg to lower yourself. Hold the banister for further support, and bring your strong leg on to the same step. With practice, taking the stairs with your cane will become second nature. Whichever cane you choose, be sure to consider every aspect of how you will use it and why you need it. Then you can be certain you’ve made the right choice to keep you safe and mobile. The right cane can make your life a lot easier. 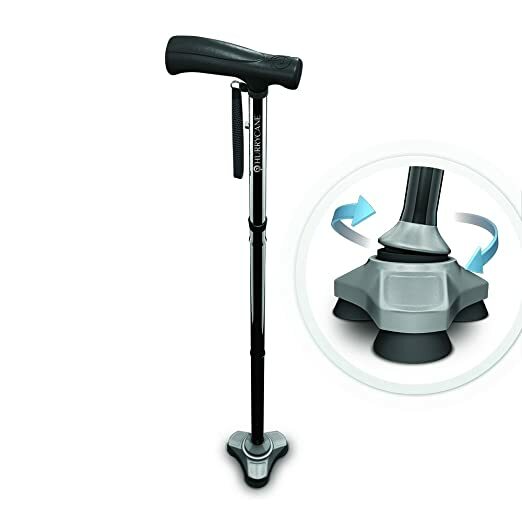 As long as you consider all the necessary factors, you are sure to enjoy your new walking aid!